George Weah's soccer talent took him from a slum surrounded by swamps in Liberia to superstardom in Paris, Milan and London, and recently president of his country. George Weah’s soccer talent took him from a slum surrounded by swamps in Liberia to superstardom in Paris, Milan and London, becoming the first and only African to win FIFA’s world player of the year award. Raised in a poor neighborhood built on a mangrove swamp on the neglected outskirts of the Liberian port capital Monrovia, Weah was elected president of his country last week. His victory over the country’s incumbent vice president, a business graduate and former consultant to the World Bank, was a lesson in how sports fame can help propel figures with humble beginnings to positions of great importance. Weah is not the first sportsman to test his popularity in the political arena. Boxer Manny Pacquiao is a senator in the Philippines, former Olympic champion runner and current IAAF president Sebastian Coe was a member of parliament in Britain, and ex-cricketer Imran Khan leads an opposition party in Pakistan. There have been others. But Weah, easily Liberia’s most famous sportsman, has reached the highest office in his land. His challenge is big, too. 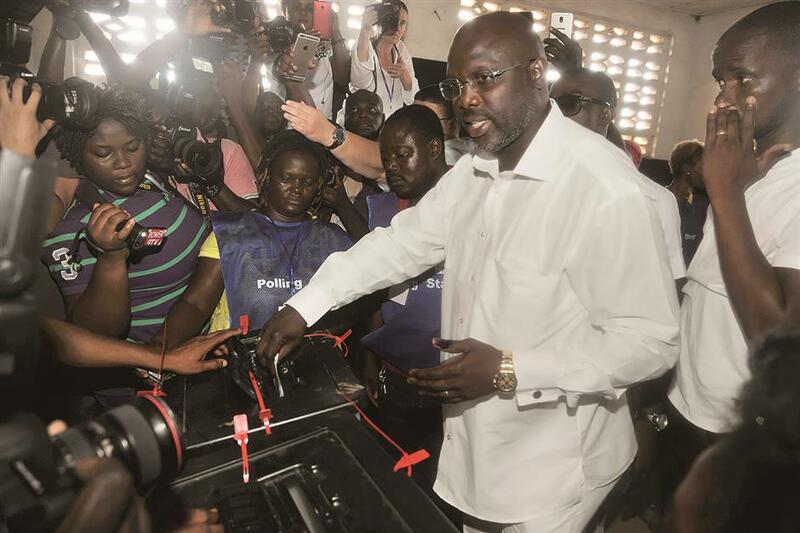 George Weah casts his vote during the presidential election in Liberia, earlier October. He was elected president of his country last week. The 51-year-old former striker, who made his name with Italian giants AC Milan in the 1990s, must lead a country that still sits in the shadow of civil war. Weah has the brutal warlord and convicted war criminal Charles Taylor as one of his recent predecessors as president of Liberia. Just as Liberia, a nation on the coast of West Africa, founded by freed slaves from America, appeared to be emerging from violence, it was rocked by the Ebola crisis in 2014-15. And there’s the grinding poverty. Poverty that Weah knows firsthand from his early years in Monrovia’s Clara Town slum. Helped by his familiarity with those hardships, Weah won the second round of voting in the presidential election by a large margin as young Liberians, especially, put their trust in a former soccer player with little experience in politics, and who only achieved his high school diploma when he was in his forties. Some of them might even be too young to remember Weah during his footballing heyday, but very few of them aren’t aware of his achievements. A league title with France’s Paris Saint-Germain in 1994, the top scorer in the 1994-95 Champions League, two league titles with AC Milan and, his greatest moment, the world player of the year and Ballon d’Or winner in 1995. Maybe more importantly for poor Liberians in the same situation as Weah was: Soccer made him rich and famous. The name Weah of Liberia stands out on that list of players who have been voted the world’s best, the only one from his continent alongside greats of the game from Italy, Spain, Germany, Brazil and Argentina. Strong, fast and with skill to match his physical prowess, he scored wondrous goals. 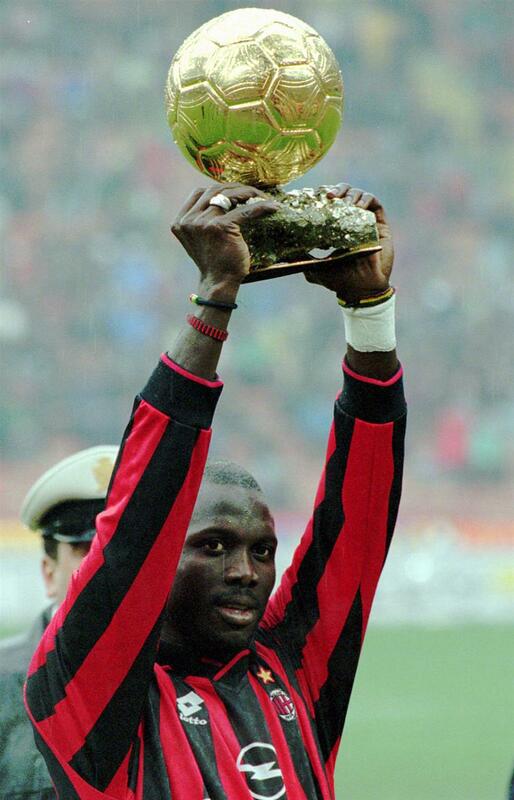 In this 1996 file photo, then AC Milan’s Liberian-born striker George Weah raised the Golden Ball trophy before the start of an Italian league A soccer match between Milan and Sampdoria in Milan, Italy. One of his best was this dizzying display of pace and skill for Milan against Verona. Two of Weah’s sons also became professional footballers, with Timothy Weah starring for the United States at last year’s under-17 World Cup. George Weah Jr, now 30, was also a youth international for the US. An African in the big leagues in Europe is not a novelty now. But in the late 1980s, when Weah senior was playing his way out of the slum, it was rare. And even rarer that he should come from Liberia, a country that still struggles to put a national team together, and not one of Africa’s more fertile football fields in Nigeria, Cameroon, Senegal or Ivory Coast. Weah played in France, Italy and for Chelsea and Manchester City in the English Premier League, and was Africa’s first superstar. He was named African Player of the Century in 1996. 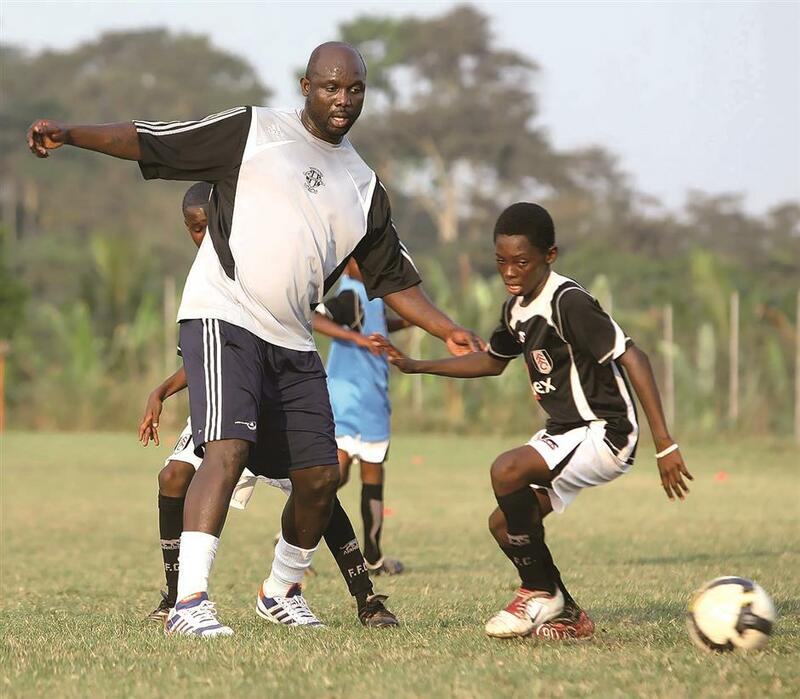 Former Chelsea and AC Milan player, world footballer of the year and now, the Liberian President, George Weah trained with scholars of the Right to Dream Academy in Dawu, Ghana in 2008. He never appeared at the World Cup — his Liberian teammates weren’t good enough to help him get there — but Weah said in a FIFA interview in 2015 that his own success was always dedicated to Liberians. “They celebrated with me and it put Liberia on the map,” Weah said. Weah’s decision to personally bankroll the Liberia national team through a number of World Cup qualifying campaigns further ingratiated him to his compatriots. Last week, those compatriots elected Weah president, pinning their dreams on an ex-soccer star whose rise from the slum appears to give them as much hope of better things as the Harvard-educated, Nobel Peace Prize-winning Ellen Johnson Sirleaf, who Weah will succeed as leader of his country.